Cars round the track during hot laps at Thunder Ridge Motorsports Park at a race July 28. 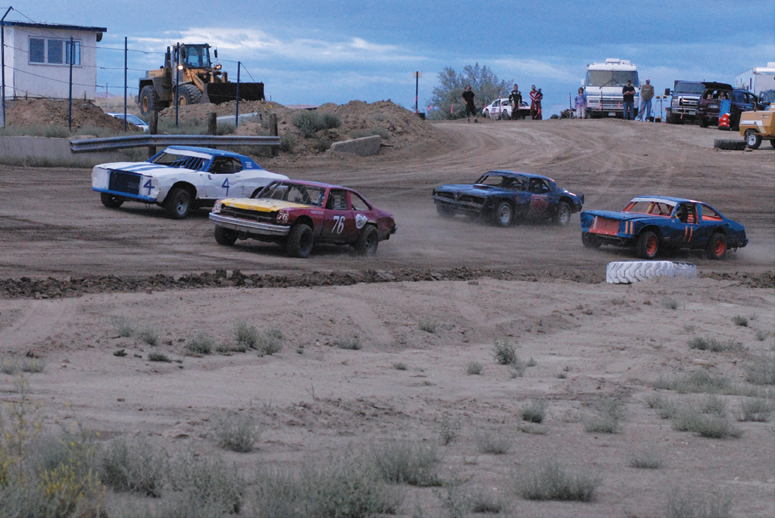 The dirt racing track, located on Ranney St. two miles south of Craig, will swap cars for trucks this weekend, hosting mud drag races and truck pulls on its infield. Thunder Ridge Motorsports Park will be hosting mud drags and truck pulls today, beginning at noon. The oval dirt track, which hosts mostly motocross and stock car races, will be changing it up for local enthusiasts. The mud drags will feature two muddy lanes on the infield of the track, where participants will attempt to navigate a drag race. In the truck pulls, drivers will get to show off their truck’s towing power as they attempt to drag tires of various sizes across the infield. The cost to attend is $10 for general admission, $7 for seniors, $5 for children ages 6 through 12, and free for children 5 and under. For more information, call Gregg Kolbaba at 629-0838 or visit http://www.thunderridgemotorsportspark.com. Organizers of the Dew Buster 5K Run/Walk and One-Mile Family Fun Run will be accepting registration until the race begins at 8 a.m. today. The Friends of Moffat County Education is hosting the race at Loudy-Simpson Park. The race costs $20 for all participants 13 and older. Runners 12 and younger can participate for free. All runners will receive a T-shirt for the event. Race-day registrations are being accepted at Loudy-Simpson. Yampa Valley Golf Course will be the site of a Ladies Professional Golf Association Girls Golf Day next week. Moffat County High School girls golf coach Ann Marie Roberts will lead the day of teaching at YVGC, for girls of all skill levels from ages 4 through 18. The day of teaching will take place Wednesday from 10 a.m. to noon. Roberts and members of the MCHS girls golf team will provide beginner and intermediate instruction for anyone interested in the game. Participants will receive a gift for attending. Craig Parks and Recreation adult softball concluded its regular season and has league tournaments taking place the next two weeks. In the B League tournament, the 8- through 14-seeded teams from the regular season will face off Aug. 6 through 8. The A League, the seven best teams from the regular season, will have its tournament Aug. 13 through 15. Yampa Valley Medical Center will host a class to educate about concussions as part of its “Taking Care of Me” education initiative. The class, titled “More than just a bump on the head: Youth Sports & Concussions,” will take place at 6 p.m. Aug. 16 at YVMC conference rooms, 1024 Central Park Dr., in Steamboat Springs.